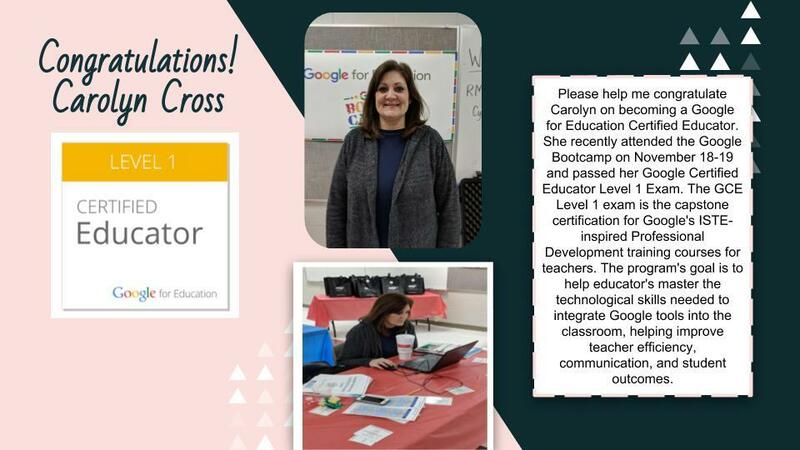 Please help us congratulate Ms. Carolyn Cross on becoming a Google for Education Certified Educator. She recently attended the Google Boot camp in November and passed her Google Certified Educator Level 1 Exam. The GCE Level 1 exam is the capstone certification for Google's ISTE inspired professional development training courses for teachers. The program's goal is to help educator's master the technological skills needed to integrate Google tools into the classroom, helping improve teacher efficiency, communication, and student outcomes. Congratulations Ms. Cross.